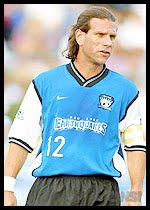 American defender Jeff Agoos has come out of retirement and will play for the San Jose Earthquakes this season. Public Relations Director Shirley Jo King has issued a press release stating that Agoos will wear uniform number 14. Realistically, Agoos will probably not start or even contribute seriously to the Earthquakes this season, but may appear off the bench. Instead of his customary central defender position, Agoos will likely play in the defensive midfield or as a wing back, where his defensive lapses will do less damage. Looking forward to seeing what Jeff Agoos can do on his 42-year-old legs. For the record, Jeff Agoos has 134 caps for the USMNT. Only Cobi Jones with a record 164 caps has more. Old man Agoos is soon to be passed on the all-time caps sheet by Landon Donovan with 130 caps. Let’s see if Jeff Agoos can still play this game. Sort of makes you wonder who will come out of retirement next. So you didn't notice the name of the "Public Relations Director" who provided the press release?